Historically, plants have proven their value as a source of phytochemicals with therapeutic potentials and recently they play an important role in the discovery of novel drugs. The current study aimed to investigate new antiobesity drugs from Plumbago europaea and Plumbago auriculata through the inhibition of the adsorption of dietary lipids. In vitro porcine pancreatic lipase inhibitory tests were conducted with weight reduction property as well as this study aimed to explore the antioxidant potential and to estimate total phenolic, flavonoid, and tannin contents in both of the studied species. Antioxidant capacity was evaluated using ferric reducing antioxidant power and DPPH assays, and porcine pancreatic lipase inhibitory tests were conducted using the UV spectrophotometric method, while total flavonoid, phenol, and tannin contents were estimated using standard phytochemical analytical methods. Antioxidant potential and total flavonoid, phenol, and tannin contents of P. europaea were significantly higher than those of P. auriculata, and both of the studied species have potential antiobesity activity in comparison with orlistat. Results of the present study show that both of the studied Plumbago species consist of bioactive compounds that can act as lipase inhibitors and therefore can be useful for the development of functional foods against obesity. It can also be used as a source of lead compounds for designing new antiobesity drugs. Further isolation, identification, and characterization of phyto-active compounds responsible for antiobesity action are required to evaluate the full therapeutic potentials of these plants. Investigation of the antiobesity and antioxidant properties of wild Plumbago europaea and Plumbago auriculata from North Palestine. For millennia, the plant kingdom has been a valuable source of therapeutic agents and till now many modern drugs are semi-synthesized or isolated from these natural sources . In the past decades, the major focus of pharmaceutical companies was mainly on synthetic molecules as a source of drug discovery due to their effectiveness, ease of production, and supply. For all these reasons, synthetic medications spread globally, while drug discovery from natural sources was associated with some intrinsic difficulties, and the pharmaceutical industry has shifted its main focus to synthetic molecules [2–4]. Unfortunately, many side effects and adverse reactions were associated with these synthetic drugs, and the world has witnessed an increase in the use of plants to treat diseases and to promote better health [5, 6]. One of the most important challenges that are still facing humanity is weight gain and obesity. This problem is drawing the attention of both the cosmetic and the pharmaceutical industries. In fact, many countries consider a slim body as a factor of beauty. In addition, obesity is currently considered a worrying epidemic disorder. In fact, it touches adults, as well as children and teenagers. It was estimated that about 300,000 people die each year from obesity and related causes, which puts this disorder as the second leading cause of death. In fact, being both overweight and obese increases the risk of several diseases and health conditions such as high triglycerides, cholesterol, diabetes, heart disease, high blood pressure, tumors (breast, colon, and endometrial), sleep disorders, and respiratory problems [7–9]. Previous studies showed that some medicinal plants contain mixtures of antioxidant phytochemical compounds such as flavonoids, tannins, and polyphenols that can inhibit or reduce oxidative deterioration of lipids, proteins, and DNA, consequently preventing neurodegenerative diseases, radiation damage, atherosclerosis, chronic inflammatory diseases, carcinogenesis, arthritis, aging, liver injury, and other pathological disorders [10–12]. 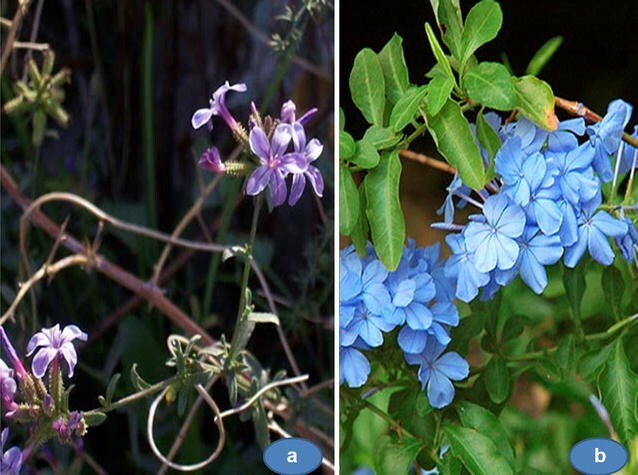 Both of the studied plants species Plumbago europaea and Plumbago auriculata (Fig. 1) belonged to the Plumbaginaceae family. Plumbago europaea L., also known as the common leadwort, is a perennial plant which is native to the Central Asia and Mediterranean regions. The plant is well known to contain europetin flavonol and plumbagin naphthoquinones [13–15]. The P. europaea plant is used for the treatment of respiratory disorders, hepatitis, edema, leprosy, inflammations, scabies, toothache, warts, blisters, injury, calluses, and skin hardness in traditional Palestinian, Jordanian, Italian, and Turkish folkloric ethno-medicines [16–22]. Plumbago auriculata Lam. (Cape Leadwort) is a species of the perennial flowering plants which are found in South Africa, subtropical gardens in Florida, and in all the warm winter climate regions across the world . In South African and Arabian folk medicines, P. auriculata is used for the treatment of malaria, wounds, gastro-esophageal reflux disease, broken bones, and to remove warts [24–27]. Sitosterol steroids, plumbagin naphthoquinones, epi-isoshinanolone, 3-O-glucosylsitosterol, palmitic acid, and plumbagic acid were isolated from P. auriculata . The current study aimed to investigate new antiobesity drugs from the leaves of P. europaea and P. auriculata through the inhibition of the adsorption of dietary lipids. In vitro porcine pancreatic lipase inhibitory with weight-reducing properties were conducted for this purpose. In addition, this study aimed to explore the antioxidant potential and to estimate total phenolic, flavonoid, and tannin contents in both of the studied Plumbago species. To the best of our knowledge, all the evaluated plants in this study have not been screened before, either for their antiobesity activity or for their total tannin, flavonoid, and phenol contents. Shaker device (Memmert shaking incubator, Germany), rotary evaporator (Heidolph OB2000 Heidolph VV2000, Germany), UV–visible spectrophotometer (Jenway 7135, England), grinder (Moulinex model, Uno, China), and balance (Rad wag, AS 220/c/2, Poland) were used in this study. Methanol (Loba Chemie, India), acetone (Alzahraa, Palestine), Millon’s reagent (Gadot, Israel), ninhydrin solution (Alfa Agar, England), Benedict’s reagent (Gadot, Israel), Molisch’s reagent, H2SO4, iodine solution (Alfa-Aesar, England), NaOH (Gadot, Israel), chloroform, HCl (Sigma-Aldrich, Germany), magnesium ribbon, acetic acid (Frutarom Ltd., Israel), FeCl3 (Riedel–de–haen, Germany), Folin–Ciocalteu reagent (Sigma-Aldrich, Germany), NaHCO3 (Merck, Germany), trichloroacetic acid (Sigma-Aldrich, Germany), (s)-(-)-6-hydroxy-2,5,7,8–tetramethylchroman-2 carboxylic acid (Trolox) (Sigma-Aldrich, Denmark), 2,2-diphenyl-1-picrylhydrazyl (DPPH) (Sigma-Aldrich, Germany), dimethyl sulfoxide (DMSO) (Riedel–de–haen, Germany), acetonitrile (Sigma-Aldrich, Germany), porcine pancreatic lipase type II (Sigma, USA), p-nitrophenol (PNP) (Sigma-Aldrich, Germany), orlistat, quercetin (Sigma, USA), gallic acid, AlCl3, sodium nitrite, vanillin, catechin (Sigma- Aldrich, Germany), and potassium ferricyanide (Riedel–de–haen, Germany) were used in this study. The leaves of P. europaea and P. auriculata were collected in June, 2015 from the Jericho and Tubas regions of Palestine. Botanical identification was carried out in the Pharmacognosy and Herbal Products Laboratory at An-Najah National University by the Pharmacognosist Dr. Nidal Jaradat, and the voucher specimen codes were Pharm-PCT-1899 and Pharm-PCT-1900, respectively. The leaves were washed and then dried in the shade at room temperature until all the plant parts became well dried. After drying, the plant materials were ground well into a fine powder using a mechanical blender and transferred into airtight containers with proper labeling for future use. About 10 g of the grounded leaves of P. europaea and P. auriculata plants were soaked separately in 1 l of three different solvents (water, methanol, and acetone), and each of the extracts was placed in a shaker device at 100 rounds per minute for 72 h at room temperature and then stored in a refrigerator for 4 days. After that, the extract was filtered using Whatman filter paper No. 1 and concentrated under vacuum on a rotary evaporator at 35 °C. The crude extracts were then stored at 4 °C in the refrigerator for further use . Qualitative preliminary phytochemical screening of primary and secondary metabolic compounds such as starch, phenols, cardiac glycosides, flavonoids, saponin glycosides, alkaloids, steroids, volatile oils, and tannins was carried out according to the standard common phytochemical methods described by Trease and Evans  and Harborne . Methanolic extracts were subjected to this assay by preparing methanolic solutions of different concentrations (100, 200, 300, 400, and 500 µg/ml), and 1 ml from each dilution was mixed with 2.5 ml of phosphate buffer (200 mM, pH 6.6) and 2.5 ml of 1% potassium ferricyanide in a separate tube. The tubes were placed in a boiling water bath for 20 min at 50 °C, cooled rapidly, and then mixed with 2.5 ml of 10% trichloroacetic acid and 0.5 ml of 0.1% ferric chloride. The amount of iron (II)–ferricyanide complex formed was determined by measuring the formation of Perl’s Prussian blue at 700 nm after 10 min, and the presence of antioxidants (reductants) in the sample would result in the reduction of Fe3+ to Fe2+ by donating an electron. The amount of Fe2+ complex formed by the reduction of Fe3+ can be monitored by measuring the formation of color complex at 700 nm. An increase in absorbance indicates an increase in reduction ability. The reducing capacity of the compound may serve as a significant indicator of its potential antioxidant activity. This would have the effect of converting free radicals to more stable products and thus terminating free radical-initiated chain reactions . where A is the optical density of the blank and B is the optical density of the sample. The antioxidant half maximal inhibitory concentration (IC50) for the plant samples and the standard were calculated using BioDataFit edition 1.02 (data fit for biologist). The porcine pancreatic lipase inhibitory assay was adapted from Zheng et al. and Bustanji et al. with some modifications. From the prepared 1 mg/ml plant extract stock solution in 10% DMSO, solutions of five different concentrations (200, 400, 600, 800, and 1000 μg/ml) were prepared, while 1 mg/ml stock solution of pancreatic lipase enzyme was prepared immediately before use, which was suspended in Tris–HCl buffer. The stock solution of PNPB (p-nitrophenyl butyrate) was prepared by dissolving 20.9 mg of PNPB in 2 ml of acetonitrile. For each working test tube, 0.1 ml of porcine pancreatic lipase (1 mg/ml) was added to a test tube containing 0.2 ml plant extract from each diluted solution series for each studied plant. The resulting mixture was then made up to 1 ml by adding Tris–HCL solution and incubated at 37 °C for 15 min. After the incubation period, 0.1 ml of PNPB (p-nitrophenyl butyrate) solution was added to each test tube. The mixture was again incubated for 30 min at 37 °C. Pancreatic lipase activity was determined by measuring the hydrolysis of p-nitrophenolate to p-nitrophenol at 405 nm using a spectrophotometer. The same procedure was repeated for Orlistat which was used as a reference compound . Total tannin content (proanthocyanidins) was determined according to the method of Sun et al. , with some modification. To 0.5 ml of each of the diluted catechin solutions of different concentrations (0.1, 0.4, 0.5, 0.7, and 1 mg/ml), 3 ml of 4% vanillin solution in methanol and 1.5 ml of concentrated HCl were added. The mixture was allowed to stand for 15 min, and absorption was measured at 500 nm against methanol as a blank. The amount of total tannins is expressed as mg (+)-catechin/g plant extract (mg CAE/g). All samples were analyzed in triplicate. The same procedure was repeated for methanolic extracts of the two plants . Total phenolic content in the plant methanolic extract was determined using spectrophotometric method with some modifications . 1 mg/ml stock aqueous solutions of methanolic extracts were prepared. The reaction mixture was prepared by mixing 0.5 ml of plant extract solution, 2.5 ml of 10% Folin–Ciocalteu reagent dissolved in water, and 2.5 ml of 7.5% of NaHCO3 aqueous solution. The samples were incubated in a thermostat at 45 °C for 45 min. The absorbance was determined using a spectrophotometer at the wavelength of 765 nm. The samples were prepared in triplicate for each analysis and the mean value of absorbance was calculated. The same procedure was repeated for the standard solution of gallic acid and the calibration line was construed. Based on the measured absorbance, the concentration was expressed in terms of gallic acid equivalent (mg of GAE/g of extract), and this procedure was repeated three times for both of the studied Plumbago species. Total flavonoid content was measured with the aluminum chloride colorimetric assay . 10 mg of quercetin was dissolved in 100 ml of methanol and then diluted to 10, 30, 50, 70, and 100 µg/ml using methanol. The stock solution of plant extract was prepared by dissolving 100 mg of the methanolic extract in 5 ml methanol and transferred to a 10-ml volumetric flask and made up to the volume with methanol. 0.3 ml of 5% sodium nitrite solution was added into each working test tube. After 5 min, 0.3 ml of 10% aluminum chloride was added. At the 6th minute, 2 ml of 1 M sodium hydroxide was added. Finally, the volume was made up to 10 ml with distilled water and mixed well. The absorbance was measured at 510 nm using a UV–visible spectrophotometer. A blank test was performed using distilled water. Quercetin was used as the standard. The samples were analyzed in triplicate. The calibration curve was plotted using standard quercetin. The total flavonoid content of the extract was expressed as mg of quercetin equivalents/g (mg of QUE/g) of plant extract, and this procedure was repeated three times for both of the studied plants species. Qualitative phytochemical screening examinations of P. europaea and P. auriculata showed that the aqueous and organic (acetone, methanolic) extracts contain the same phytochemical classes such as cardiac glycosides, alkaloids, starch, phenols, tannins, phytosteroids, flavonoids, and volatile oils as presented in Table 1.
where Y is the absorbance at 500 nm and X is the total tannin content in the plant methanolic extract. The total tannin content according to the standard calibration curve equation shown in Fig. 1 was 29.58 ± 0.24 mg CAE/g for P. europaea methanolic extract, while that for P. auriculata was 9.55 ± 0.2 mg CAE/g (Fig. 2). where Y is the absorbance at 765 nm and X is the total phenolic content in the plant extract. The total phenolic content in P. europaea methanolic extract was 41.5 ± 0.58 mg GAE/g of plant extract, which is a relatively high percentage of phenolic content, while in P. auriculata the total phenolic content was 24.3 ± 0.45 mg GAE/g plant extract which is relatively low in comparison with the methanolic extract of P. europaea. where Y is the absorbance at 410 nm and X is the total flavonoid content in the plant methanolic extract, as presented in Fig. 4. From the standard calibration curve shown in Fig. 3, the total flavonoid content in the methanolic extract of P. europaea was 94.66 ± 0.94 mg QUE/g of plant extract which is considered a relatively high percentage of flavonoid content. On the other hand, the total flavonoid content in the methanolic extract of P. auriculata was 87.12 ± 0.5 mg QUE/g of plant extract. All the previous results of total phenolic, flavonoid, and tannin contents of methanolic extract for both Plumbago plant species are listed and explained in Table 2 and Fig. 5. IC50 values for P. europaea and P. auriculata were 21.38 and 89.12 µg/ml, respectively, while that for Trolox was 1.85 µg/ml (Fig. 6). This indicates the high potential for free radical scavenging of P. europaea versus P. auriculata. The antioxidant can donate an electron to free radicals, which leads to neutralization of the radicals. Reducing power was measured by direct electron donation in the reduction of Fe3+(CN−)6–Fe2+(CN−)6 (Fig. 7). The product was visualized by forming the intense Prussian blue color complex and then the absorbance was measured at the λ value of 700 nm. As shown in Fig. 6, a higher absorbance value indicates a stronger reducing power of the samples. Using ferric reducing power assay, IC50 value for the methanolic extract of P. europaea was 69.18 µg/ml and that for the methanolic extract of P. auriculata was 70.79 µg/ml, whereas the IC50 value for Trolox was 50.12 µg/ml. This result indicates the relatively high ferric reducing activity of these two extracts compared to pure standard Trolox. The methanol extracts anti-lipase IC50 value of P. europaea and P. auriculata was 134.29 and 130.32 µg/ml, respectively, as shown in Fig. 8. This result showed that both the studied Plumbago species possess relatively the same inhibitory action against lipase enzyme. The orlistat reference standard compound showed a very high percentage of inhibition against pancreatic lipase enzyme with an IC50 value of 29.9 µg/ml, while the extracts of P. europaea and P. auriculata showed relatively moderate lipase inhibition compared with orlistat (Fig. 8). Recently, the focus on medicinal plants research has increased considerably, especially for those plants that were used in folk medicines. This increasing interest is due to the scarcity of therapeutic agents available to treat chronic diseases, increasing of bacterial resistance and the harmful side effects of chemical compounds [39, 40]. Natural plant products containing polyphenolic compounds such as phenolic acids, tannins, anthocyanins, and flavonoids were demonstrated to have potential health benefits for the treatment of metabolic disorders such as diabetes mellitus, hypercholesterolemia, overweight, and obesity . Several studies were conducted on natural products in order to assess their pharmacological activities including antioxidant and anti-lipase effects [42–44]. Therefore, the consumption of flavonoids in food and other supplements has been advised to reduce weight gain and obesity [45–47]. In this context, P. europaea and P. auriculata exhibited high flavonoid contents of 94.66 mg QUE/g and 87.12 mg QUE/g, respectively, which may explain their anti-lipase activity. In addition, P. europaea and P. auriculata showed a promising antioxidant activity in both of the utilized DPPH and ferric reducing assays. On the other hand, total phenolic content was higher in P. europaea, which was 41.5 mg GAE/g, while in P. auriculata the total phenolic content was 24.3 mg GAE/g. At the same time, the total tannin content was also higher in P. europaea than in P. auriculata, which were 29.58 mg CAE/g and 9.55 mg CAE/g, respectively. In another investigation conducted by Amoo et al. in South Africa, the total phenolic and flavonoid contents in P. auriculata were 15.0 mg GAE/g and 5.5 mg QUE/g, respectively. This means that wild-growing P. auriculata used in our study had much better total phenolic and flavonoid contents than South African P. auriculata . Using ferric reducing power assay, the IC50 values were 69.18 and 70.79 µg/ml for the methanolic extracts of P. europaea and P. auriculata, respectively, whereas the IC50 value for Trolox was 50.12 µg/ml. This result indicates the relatively high ferric reducing activity of these two extracts compared to Trolox. Moreover, using DPPH assay the IC50 values for P. europaea and P. auriculata were 21.38 and 89.12 µg/ml, respectively, while the IC50 value for Trolox was 1.85 µg/ml. This indicates the high potential antioxidant activity of P. europaea versus P. auriculata. Moreover, there was a significant linear correlation between the antioxidant activity determined using the DPPH and ferric reducing assays and the total phenolic, tannin, and flavonoid contents in both of the studied Plumbago species. However, no significant relationship was observed between the antioxidant activity and the total tannin, phenolic, and flavonoid contents in both of the studied Plumbago species and the anti-lipase activity because both of the studied species had almost the same potential as anti-lipase drugs. A study conducted by Bircan and Kirbag  evaluated the antioxidant activity of P. europaea growing in Turkey using DPPH assay and found that it was 83.62 µg/ml, while in the studied P. europaea growing in Palestine it was 21.38 µg/ml which exhibited an antioxidant activity four times better than that of the Turkish P. europaea . In fact, the impact of the flavonoid content on anti-aging and anti-lipase activities was documented. On the other hand, both of the studied species had more powerful antioxidant activity than Plumbago zeylanica that had an antioxidant activity of 88.45 µg/ml which was studied by Sini et al. and which is almost equal to the antioxidant activity of P. auriculata which was 89.12 µg/ml. In fact, overweight and obesity have become epidemics and are increasing at an alarming rate in both the developed and developing countries [51, 52]. Pancreatic lipase is considered the principal lipolytic enzyme which plays an essential role in the efficient digestion of lipids and is responsible for the hydrolysis of about 70% of total ingested fats . The IC50 value showed potent inhibitory action against lipase enzyme when comparing with Arum palaestinum which was previously reported by Bustanji et al. to have potent lipase inhibitory action with an IC50 value of 107.7 µg/ml. For the studied Plumbago plant species, the potential activity against pancreatic lipase enzyme can be attributed to the high content of flavonoids which are well known to exhibit potential activity against pancreas and liver enzymes. In the present study, the total contents of phytochemical compounds including flavonoids, phenols, and tannins as well as their antioxidant and antiobesity activities of the two species, P. europaea and P. auriculata, were evaluated and compared. The obtained results suggested that these plants have moderate to potent antioxidant activity and both of them had high contents of flavonoids. In addition, they could be used as a source of lead drugs for developing new antiobesity agents. However, further isolation, identification, and characterization of phyto-active compounds responsible for anti-lipase action are required to evaluate the full therapeutic potentials of these plants. All research has been done by the authors. All authors read and approved the final manuscript. The authors acknowledge the assistance of the technicians Mohamad Arar and Linda Esa, and a special thanks to Jonathan Wright (English Center—An-Najah National University) for English language editing and proofing.